Meet our driver at hotel & drive to Badrinath. Visit on the way Devprayag & Rudraprayag. Check into the hotel arrival at Badrinath. Overnight stay at Badrinath. 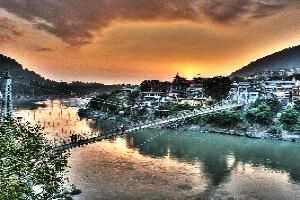 Rudraprayag:-Rudraprayag is one of the PanchPrayag five confluences of Alaknanda River, the point of confluence of rivers Alaknanda and Mandakini. Kedarnath, a Hindu holy town is located 86 km from Rudraprayag. The famous man eating Leopard of Rudraprayag hunted and written about by Jim Corbett hunter dwelled here. Weather– Generally pleasant in summer, the temperature ranges from 25-30 degree Celsius. Cold in winters. Early morning having a bath in the Taptkund have the Darshan of Badrinath Temple. Brahamakapal is significant for PinddanShraddh of ancestors Pitrus. 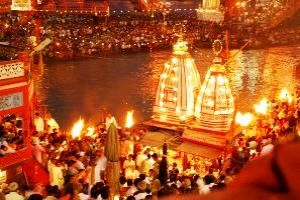 There are other interesting sightseeing spot like Mana, VyasGufa, Maatamoorti, Charanpaduka, Bhimkund and the “Mukh” of the Saraswati River. Just within the 03kms of Badrinathjee. Evening visit Badrinath Temple for Aarti. Overnight stay at Badrinath. Badrinath:-Badrinath one of the 'Ancient Four Dhams' is one of the most celebrated pilgrimage spots of the country and is situated at an elevation of 3, 133 meters, guarded on either side by the two mountain ranges known as Nar & Narayan with the towering Neelkanth Peak providing a splendid backdrop. This revered spot was once carpeted with wild berries. Thus the place got the name "Badri van", meaning "forest of berries". TaptKund: Natural thermal springs on the bank of the river Alaknanda, where it is customary to bath before entering the Badrinath temple. 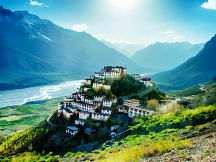 Mana Village: Inhabited by an Indo-Mongolian tribe, it is the last Indian village before Tibet. Vasundhara: As the name suggests, vasundhara is a magnificent water fall. This place is 5 kms from Badrinath out of which 2 kms is motor ableup to Mana. BhimPul: On the other side of Mana village, a massive rock forming a natural bridge lies over the roaring Saraswatiriver. It presents a spectacular view of water thundering down through the narrow passage under the rock and is believed to have been placed there by Bhim, the second eldest among the five Pandava brothers. VyasGufa cave: Near Mana Village, this is a rock-cave where VedVyas is believed to have composed the Mahabharata and the pauranic commentaries. Badrinath Weather: The average maximum temperature will be around 18° Celsius and the average minimum is 8° Celsius. Warm and woolen clothes are hence required for a stay in Badrinath throughout the year. 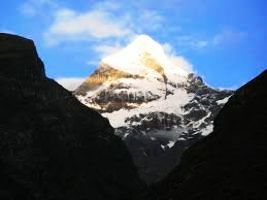 Winter in Badrinath is often accompanied by snow falls. Winter is very chilly with an average temperature of 5° Celsius. Due to the extreme climatic conditions, this time is usually closed for tourists. Later drive back to devprayag via Joshimath. Check into the hotel arrival at devprayag. Overnight stay at Devprayag. Joshimath: - Joshimath is situated on the slopes above the confluence of the rivers Alaknanda and Dhauliganga. 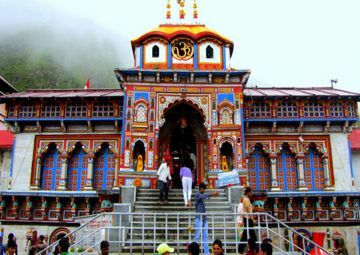 Of the four ‘Maths’ established by AdiShankaracharya, Joshimath is the winter seat of Badrinath. The idol is brought down to Joshimath and installed in the temple for people to worship. There are many other temples in the township. The most important is the temple of Nir Singh with the idol of Lord Vishnu. The left arm of this deity is getting destroyed with time and the popular belief holds that the day the arm completely withers Badrinath valley will cease to exist and the Gods will transfer the residence into the neighboring Niti Valley at BhavishyaBadri. 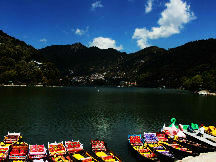 Devprayag :-Devprayag city is of huge spiritual importance and is situated in TehriGarhwal region of Uttarakhand. Set apart by the confluence point of rivers Alaknanda and Bhagirathi, Devprayag Tourism, a religious center and is very well known among travelers wanting journey or looking for some solitude near nature. The word Devprayag in Sanskrit implies the 'Sacred Confluence'. 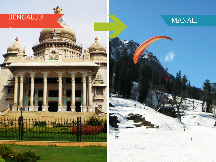 Being settled perfectly in the lap of Himalayas, the city is a total bundle of quietude and quietness. It is here in Devprayag that the confluence of Alaknanda and Bhagirathi happens and the bound together stream is known as Ganga. Dotted with antiquated sanctuaries and symbols in the midst of the rich green environment, this place is an extremely beautiful place. 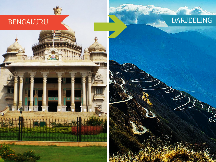 After breakfast, check out from the hotel and drive to haridwar Railway station.